Cozy country cottage for rent. 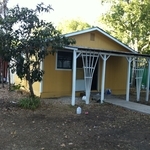 1bedroom/1bath/living room/kitchen and dinette. $650 per month. All bills included. Available immediately. $650 per month. $650 refundable security deposit. $50 app fee per adult that'll reside on the property.